A few weeks ago I was awaiting two days impending doom and misery outside a hotel conference room and reading a copy of USA Today to pass the time. Thumbing through the pages, I came across a picture of a guy and a Golden, so naturally, I had to read. 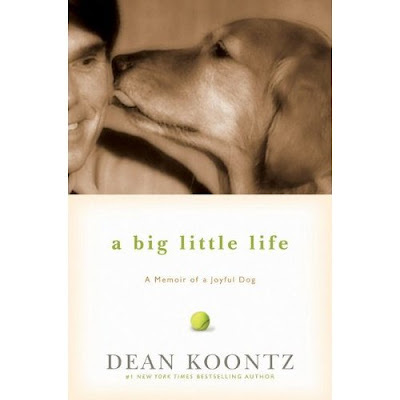 It turns out the article was about Dean Koontz and a little about his life, a little about his home and a little about what he had on the horizon. All of it was sprinkled with tales of his love for his dog and how some dumb old dog changed his life and how his most recent dog was carrying on the tradition. I've never been a huge fan, but have read a few of his books. Don't ask me about titles or when or where I read them or why. This book of his seems different. I've never been able to read books about dogs. The one and only dog book I've ever read was Marley and Me and I did that right after it came out. I've read the first 50 pages of Where the Red Fern Grows at least 10 times, but always have to put it back on the shelf. The most recent dog book I quit on was The Art of Racing in the Rain, but that one was easy to put down after several pages of twisted political ideology early on...it made for a good excuse anyway. I'm not a "breedist." I read Marley after all! There is just something about dog books that I've always been scared of...the endings. Recent events in my life and the lives of others (sparked by the article on Koontz) have inspired me to make my summer reading all about the dogs. I have to wait until the end of August to pick up A Big Little Life, and I have a copy of Red Fern, so I'll start with that. Again. Does anyone have any other suggestions? The one caveat is that the book must be about a dog from either the sporting, herding, working or hound group. I just can't relate to the others. Maybe I am a "breedist" after all. "Watchers" by Koontz was pretty good. Try Jon Katz, he writes about border collies. I've never read his books but I really like his Slate essays. I loved The Art of Racing in the Rain. Cried so hard in the car that Ferris licked my face.